Play as the creepers, skeletons, animals, Steve, or Herobrine in this Minecraft-inspired map. Due to the file-size limitations, and the deceivingly large number of polygons, the amount of texture I was able to put on the map is much lower than I would have liked. Review by [Ag⁴⁷] Wolffe on 12/27/2014. Thanks for the review. I could make the territories larger, I just didn't want to cover up too much of the blocks in doing so. I'll consider making them larger for a future version. Review by Nathan on 12/29/2014. Loads of fun and very strategic. Great work. My only complaint is that the faction starting in the Skeleton Cave is at a major disadvantage because it is subject to almost immediate attack from all 4 other factions. Decent map, strategy is straight forward, just not always simple to execute thus creating the challenge. Review by Malteus [GER] on 12/27/2014. Review by OTPM on 1/3/2015. Review by Norman on 12/30/2014. 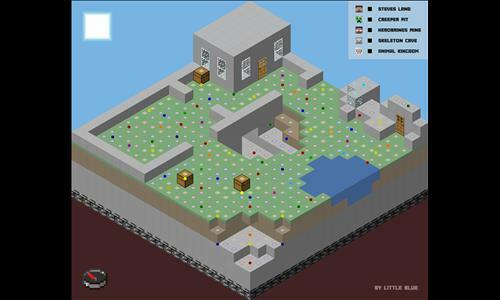 Calling your map "Minecraft by Little Blue" was a good choice since maybe someone else will create a Minecraft map. However maybe the other Minecraft map creator will also name himself Little Blue so that makes the name not that good again.